Michael Barton Lewis is a San Francisco based painter, who works mostly with acrylics and photocopies. His mixed-media paintings build on the traditions of Abstract Expressionism and Surrealism. 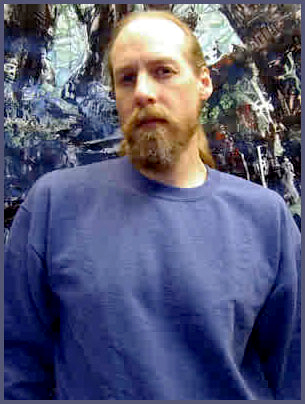 Originally from Nebraska, Mr. Lewis received his bachelors in fine art from Nebraska Wesleyan University in 1986. In 1987 he moved to San Francisco with his wife, the sculptor and solo performer, Nena St. Louis. Since then he has worked continuously in painting, xerographic collage and screen printing, showing his art work in competitions and curated exhibits throughout the west and Midwest. He has also worked professionally as a screen printer, graphic designer and fabricator. In addition to creating art, Mr. Lewis has also curated several exhibitions in the San Francisco Bay area. He has also devoted much of his time to theatrical productions as a set designer and prop master for the Fool's Fury theater company and Second Wind Productions, as well as for Nena St. Louis. From 1988 to 1990 he studied dramatic fiction writing with novelist James N. Frey at the U.C. Berkeley Extension in San Francisco. He has applied his writing skills mostly in collaboration with his wife, serving as a dramaturg on several of her solo plays. In 1997 he collaborated with Kieron Dwyer and M.C. Mars on the underground comic book, Greed Anger and Stupidity. In 2001 he directed and toured the play JUMP! which was written and performed by his wife, Nena St. Louis.